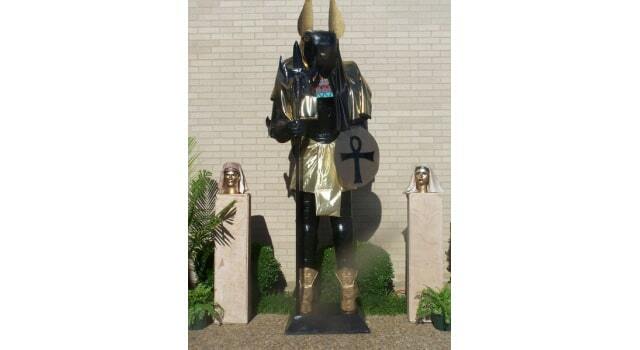 I found your website a couple of months ago when I was attempting to build an anubis out of paper mache for prom. Prom was last night and I not only made 2 anubis but a sphinx and 2 standing anubis (the face was the only thing I made from paper mache). You had asked me to share pictures of my projects so here they are. Thank you so much for your website and the advice you gave to me in my learning experience using paper mache. My next project is a sandhill crane. 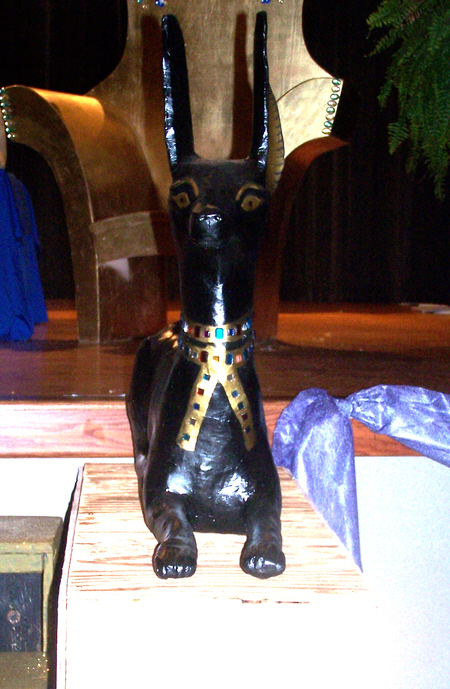 I do have to say I had a little trouble with the paper mache clay so I only used it on one anubis. The problem I had was the texture. I was unsuccessful in getting it smooth. I don’t know if I didn’t sand it good enough or what. Anyway, a success none the less. I admit that I had to look up the word “anubis” when I first heard from Tiffiny. I learned that this is “is the Greek name for a jackal-headed god associated with mummification and the afterlife in Egyptian mythology.” You learn something new every day! (I’ll give you all a hint about getting the clay nice and smooth without sanding after you see the photos below). Am I the only one old enough to remember a Senior Prom decorated with crepe paper streamers? Tiffiny did a fantastic job on these decorations – I hope the kids know how much work went into them. Tomorrow you get to see a wedding decorated with fabulous paper mache trees – but first, how to make paper mache clay smooth without sanding: Spread your clay onto your form, and then dip the knife into water to dampen it. Run the knife’s flat side over the clay to make it smooth. Or, you can place a piece of plastic film over the clay and then use the flat side of the knife over the plastic. When the clay is very dry, make a gesso using 1 tablespoon joint compound, 1 teaspoon Elmer’s Glue-All, and a dab of white acrylic paint. Apply the gesso to the sculpture, and when it’s completely dry use a soft dampened brush to smooth out all the brush marks. This will fill in any tiny gaps that are left in the clay. If you use several layers of gesso, your sculpture can be made as smooth as porcelain. Oops, I was going to upload a picture to my previous post. So here it is. Great space shuttle. And it actually looks like it was easier to make than if you’d stuck with the paper mache idea. This would work perfectly for a VBS. If you have any other questions or want specific specs to build your own I’d be happy to help all I can. Just go to my site, frogspot.com and email me. I’m planning to make a space shuttle for a kids program I’m doing in a couple of weeks. The shuttle frame will be made of PVC pipe and it will be large enough for 30 kids to get into. I’m considering using paper mache to do the shell. My thought is that I could weave cheep twine in and out of the PVC ribs and then paper mache over that. Also, since the kids will be inside it, the shell needs to be durable enough to withstand some abuse. How many layers would you recommend? Hi Steve. The abuse issue is fairly easy – 8 or nine layers should be tough enough if the kids don’t bring baseball bats or start a fight inside your space shuttle. However, with a room-sized item like this, my first thought is “what would the fire marshal think?” Fire-proofed canvas would be a lot more expensive, but might pass an inspection. I don’t mean to be a party-pooper, but paper burns, and paper that is exposed on both sides will burn fast, so I have some concerns about your project. Did you ever build your shuttle. I’m in the process of building a space shuttle for Vacation Bible School. I am planing to cover some of it with paper mache and the rest in cardboard. Do you have any pics of your project. This dosent have much to do with this thread ,but I recently tride to make a tree stump with a simualar clay recipie.I used 2 inch thick insalation foam and cut out small sqare pieces of it abuot one inch thick in with with a butter knife and put it on the form with the clay .Once it dride I cocverd it with my own clay recipe,I didn’t measure the ingredients sadly.I thought this might help someone. All I can say is WOW!! These are wonderful. I am so impressed. I would like to know more about how you constructed the rest of the pieces too. Congrats on a Fabulous job…..What a lucky daughter! Tiffiny, you said you didn’t use paper mache except for the face of the Anubis. Can you tell us how you made the other forms? What material did you use instead? The standing anubis was originally a knight and I mad a “mask” out of paper mache to go over the head and then decorated with fabric etc. 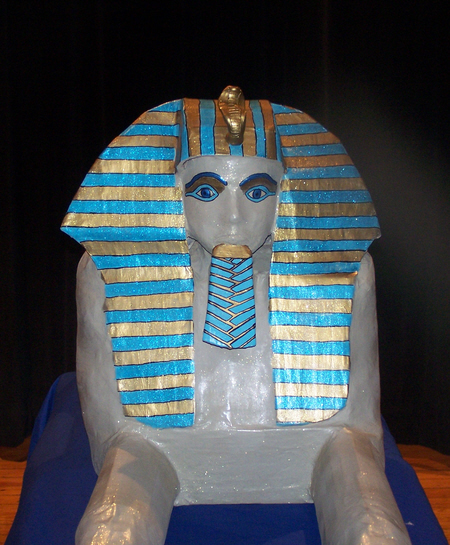 The sitting anubis and the sphinx were completely paper mache. I took your advice/tutorials and used cardboard to make a sillohette and then crumbled paper and used masking tape to tape the crumbled paper on the sillohette. The legs and ears were also cardboard and crumbled paper/tape. The sphinx was a huge challenge for me because I was running out of time. So instead of a sillohette, I rolled cardboard for the body and stuffed it with paper. Then attached the legs (cardboard also) and crumbled paper to give them depth. The head was a styrofoam wig head that I “fattened” up with paper mache clay. The hat was cardboard that I pieced together. That was the toughest part. I had very little time to think outside the box and come up with something more creative/easier to use. I also used paper mache clay to add the details on the face of the sitting anubis. Thanks so much for sharing my work and I definitely learned a lot and look forward to experimenting with some more projects at my leisure instead of with a time restraint. Thanks, Tiffiny. That info was really helpful. What a lot of work – and you did such a nice job. Did the kids enjoy their prom?